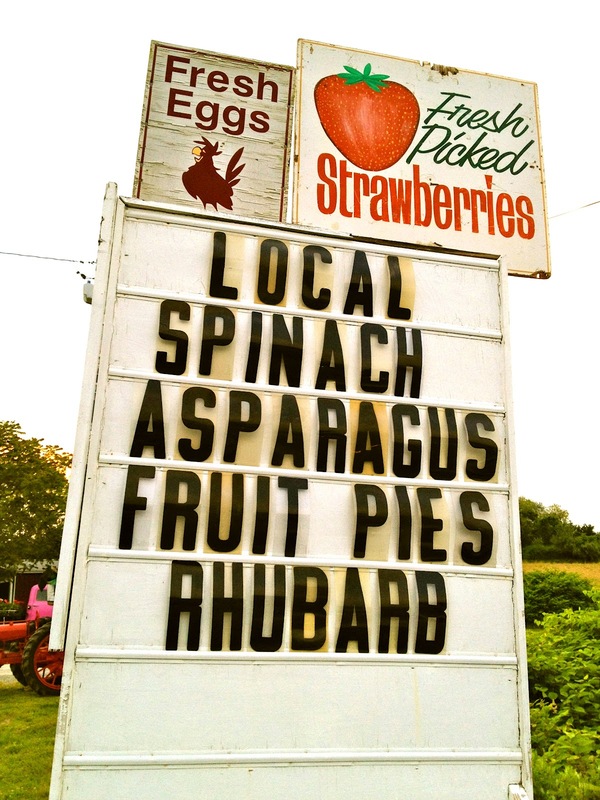 Rhubarb, a popular item at summer farm stands, is more versatile than you think. Beyond its common applications in pies and crumbles, Rhubarb makes a great addition to savory entrees too. Their crisp, ruby red stalks are extremely tart on their own, but once sweetened up by sugar, honey, or the addition of fruit (such as cherries or raspberries), rhubarb yields an amazing sweet/tart flavor that complements meats and even salads and vegetables. ~Rhubarb is related to buckwheat. Who knew? ~Rhubarb is a veggie, not a fruit. ~First used for medicinal purposes, Rhubarb originated in China. It is an ancient plant and appears in food history as early as 2700 BC. ~The green leaves of the Rhubarb are poisonous when ingested in large quantity. Eat only the stalk! 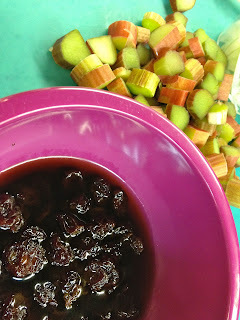 To fully discover Rhubarb, I decided I would not only make a traditional dessert preparation - a Rhubarb Compote suitable for topping all manner of sweet treats - but I also thought it would be fun to find out how Rhubarb works in a savory dish. Check out the results and give this stalk a chance if you are looking for a great seasonal ingredient this summer. and Cinnamon Stick with 1/4 cup hot water. Meanwhile, heat 1 Tablespoon Olive Oil in a small saucepan. Add Onion to the saucepan and cook, stirring occasionally, until the onion has softened - 8 to 10 minutes. To the softened onions, add Cherry Mixture, Sugar, and Rhubarb. Bring Mixture up to a boil. Reduce heat to a simmer and continue to cook, about 5 to 7 minutes. Remove mixture from the heat and stir in a pinch of Allspice and Salt and Pepper to taste. Warm again just before serving. Season the Pork liberally on both sides with Coarse Salt and Pepper. Heat 2 Tablespoons Olive Oil in a large skillet over Medium High Heat. Cook in batches if pan will be too crowded. Once Oil is extremely hot, add Pork Chops and cook for 3 Minutes on one side. Flip, and cook another 3 to 3.5 Minutes on the other side. Remove from skillet and stack the chops, one on top of the other, on a plate. Cover with foil and let sit for 3-4 minutes for a perfect medium rare. To serve, rewarm the Rhubarb-Cherry sauce if needed. 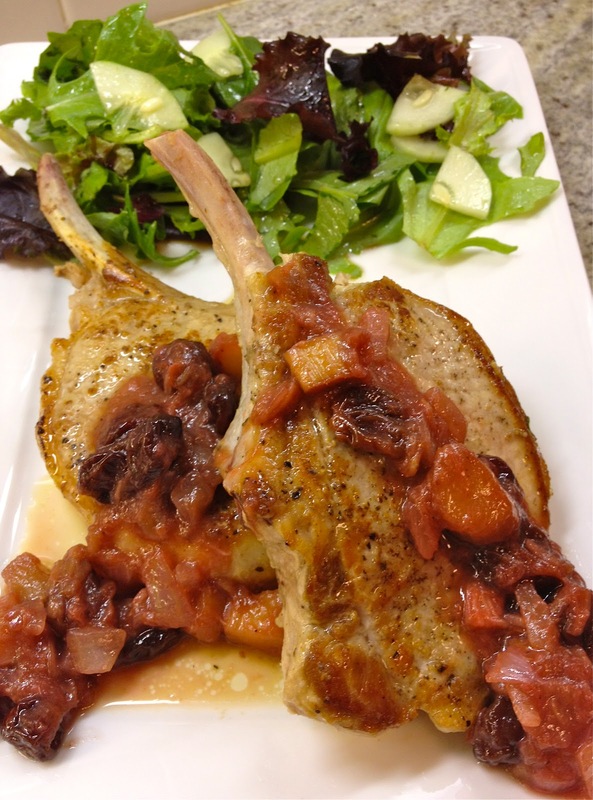 Uncover Pork Chops and arrange them on plates, pouring the juices from the chops over each. 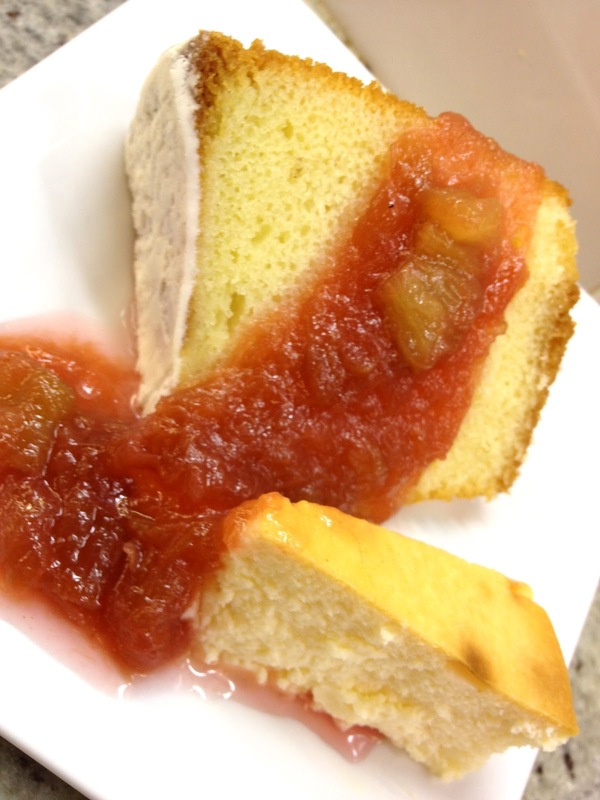 Top with the Cherry-Rhubarb Sauce and serve right away. Enjoy! Next up, a more traditional preparation fit for topping any dessert, the Rhubarb Compote. 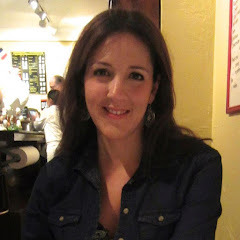 This recipe, again adapted from Martha Stewart is, as one online commenter put it, the easiest recipe in the world. Using just three ingredients, you can make a great compote in a flash that works well on just about any sweet treat. The Rhubarb actually creates it's own cooking liquid, so water is not even needed. This compote also makes a tasty topping for healthier foods like yogurt. 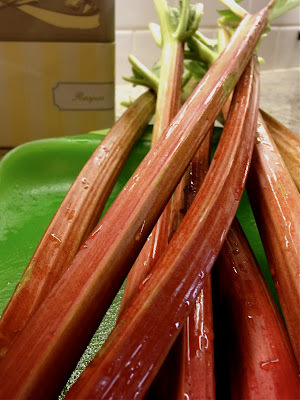 Put Rhubarb in a medium sauce pan and cover with Sugar and Ginger. Let sit about 10 minutes until liquids begin to leach from the Rhubarb. Once boiling, reduce to a simmer and cook another 5-7 minutes until Rhubarb breaks down. Let cool fully before using as a dessert topping. Enjoy! These rhubarb recipes look & sound delicious. Will be trying the Rhubarb Cherry Sauce soon. Thank you for your comment :) I hope you find them easy and fast too. Happy cooking!